Vol. 16, 2011: 311 Pages, Plates 156 B/W and Colour 30; Size 11" x 9"; Tk. 1500/ US $ 50. The Evolution of the Ashta–Maha– Pratiharya Iconography and its impact on Later Buddhist Art. Subject-Wise Classification of the Inscription on the Architectural Edifices of Bengal Sultanate: A Search for the Consistency of the Beginning Portion of the Text with the Main Theme. Sacred Sclupture Relics of the Bakreshvar Temple, Birbhum, West Bengal. Facets of Life on Terracotta Monuments. Vahana of Buddha, The planetary Deity, Illustrated in Bengal. Independent Sculptures of Single plan etary Deities from Eastern India: Problems of Identification. 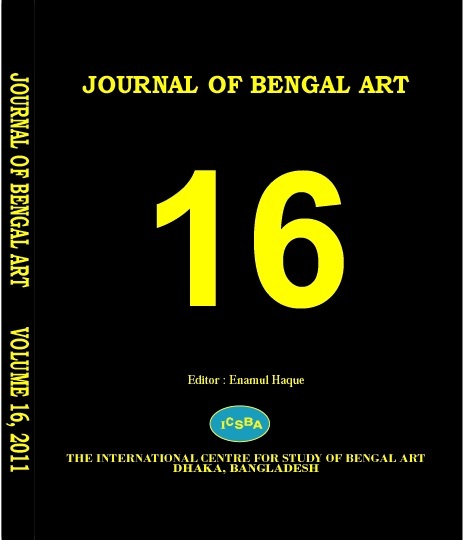 Revisiting Art, Architecture and Archeology as Sources for the History of Religion in Bengal. Kushana Terracottas from Lauriya- Nandangarh in the Collection of Indian Museum, Kolkata. A new Light on the significance of Lion Motif appeared on Coins and on a single Inscription of the Sultans of Bengal. The Iconography of the Deities in the Devyamata,an Early Shaiva Pratisthatantra, and the Art of Bengal. Archaeology of Sundarban: An Over view. Are Durga and Dargah the same? Tracing the Roots of Veneration Rituals in Historic Muslim Shrines in Bengal. Art and Architecture of Pagan in Burma and Eastern India under Pala-Sena Kings. Gateways in Sultanate Architecture of Bengal. Buddhism in Pre-Pala East Bengal According to Chinese Sources. Folk Arts and the Poetics of Durga Puja in Bengal in the 21st Century. Parinaya Scenes in the Vaivahika Images of Siva. Social Role of Monasteries in Bengal in Early Medieval Period. Unusual Objects from Excavated Buddhist Monasteries of Bangladesh.